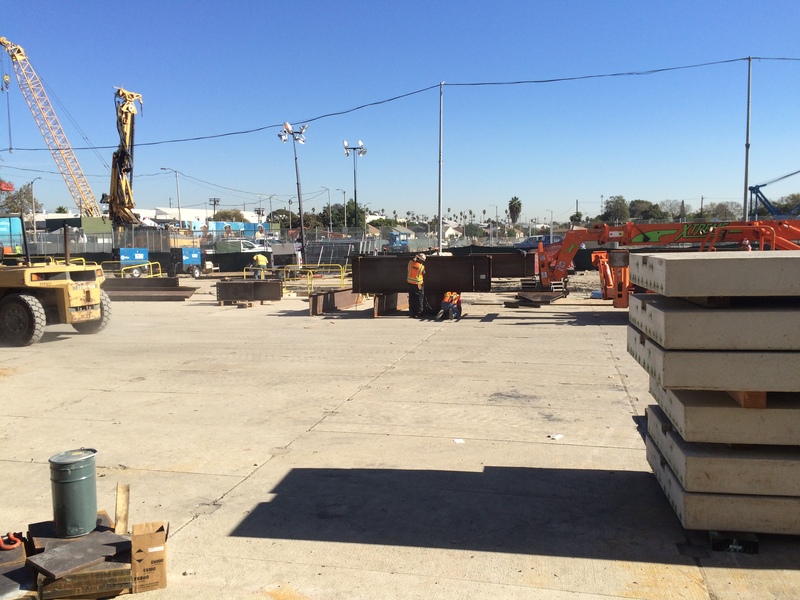 View of Crenshaw Boulevard between Rodeo Road and Rodeo Place where the decking has been completed. Photos by José Ubaldo/Metro. An important heads up: Due to the recent rainy weather, the final 90 feet of roadway decking on Crenshaw Boulevard will need to be extended for seven more days. The work is now scheduled to continue from 9 p.m. Sunday, Jan. 4, through 6 a.m. Monday, Jan. 12. The decking will cover the construction site for the Crenshaw/Expo underground station. 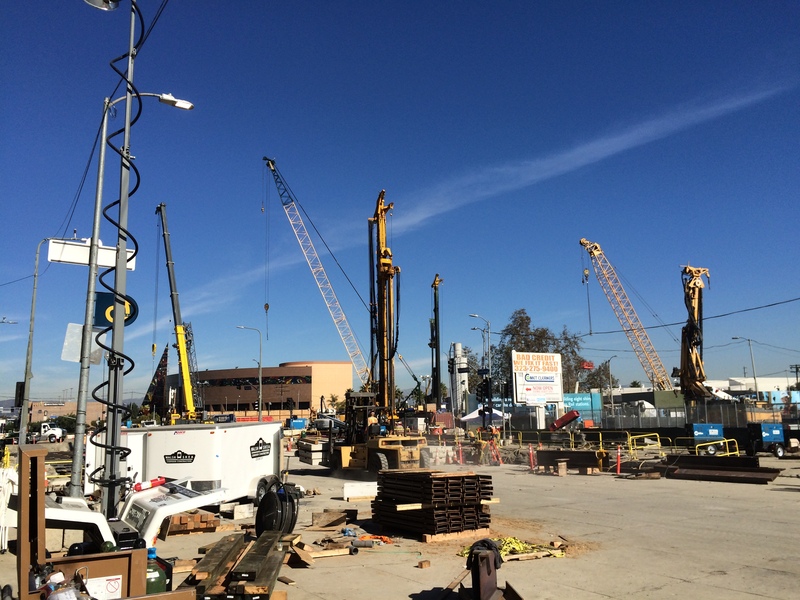 Excavation, installation of steel beams and installation of concrete planks is 85 percent complete between Rodeo Place and the Expo Line tracks. The remaining work is immediately south of the Expo tracks. The work to be done includes additional excavation of the street and installation of the remaining steel beams. Repairing and rebuilding sidewalks and driveways will then be completed in the area and street lights and traffic signals will also be reconnected. Traffic on Crenshaw Boulevard will continue to be diverted at Jefferson Boulevard. Traffic patterns on Rodeo Road, Martin Luther King Jr. Boulevard, Coliseum Street and Rodeo Place will return to normal on Sunday, Dec. 14. The work to be done includes additional excavation of the street and installation of the remaining steel beams; concrete planks over the beams will follow. Repairing and rebuilding sidewalks and driveways will then be completed in that area. Street light and traffic signals will also be reconnected. Stay tuned for more information on the Crenshaw/LAX Transit Project. Please click here to visit the project website. The 8.5-mile light rail line is funded by Measure R and will run from the Expo Line in the north to the Green Line in the south and will serve the Crenshaw Boulevard business corridor, Park Mesa Heights, Inglewood, Westchester and Los Angeles International Airport. An Automated People Mover to be built by the airport will allow Crenshaw/LAX Line passengers to travel to airport terminals. I still would like to know whether this station will have a mezzanine and where the fare collection box will eventually be located. Thanks for asking Morris. This is design/build project so we don’t have those details but we expect to have mezzanine like other underground stations. Regarding the collection box location again it’s too early but they will be there. If they were thinking this through fully and doing it correctly, now that they have the additional room from the vacated street and commercial site they would relocate the east bound platform to this side of Crenshaw and fully tie the whole thing together into a single station for easy transfers between the two lines. What David said above makes sense and I hope that it is built that way.